This particular chair is antique but I've seen both antique and reproductions available on 1stDibs.com. Lantern - Can you tell me where the lantern is from? The brass lantern is vintage. 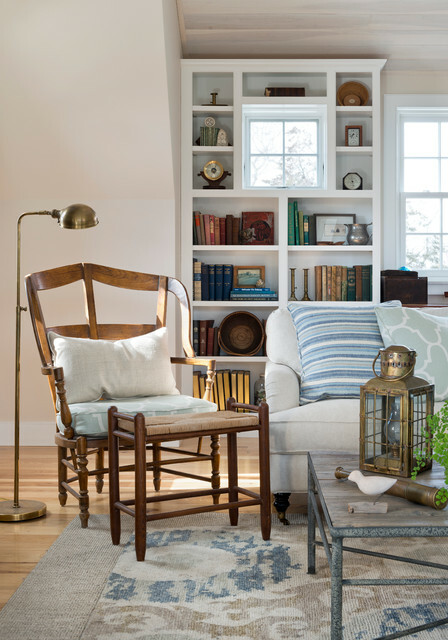 The brass floor lamp is from Circa Lighting. Can you tell the textile or fabric name of the striped pillow . Thanks - This stripe is in a number of pictures and it goes well with so many of your other fabrics that you've named. Love the rug too. Where is it from? I do, too. The rug is from Rustigian's Rugs located in Providence, RI. Where did you buy the coffee table? Include something old with your something new. Don’t buy everything new. Go to an antiques store, or if you can’t afford that, visit garage sales, flea markets or auctions, and pick up a few accessories that don’t look like you bought them off the shelf at the import store. Pieces with history give a room personality and depth, and are what distinguish a home from a furniture showroom. Make sure it's solid. If you're buying a chair, sit down and push your body back and forth. A chair that wobbles and moves with your body is loose and needs to be reglued. If you're looking at a table or bureau, set your hand on a corner and shake the piece; it shouldn't wobble. 8. Vintage brass lanterns. On Cape Cod and the Islands, brass has never gone out of style. Whether covered with a patina or highly polished, these nautical pieces make their way to tabletops and shelves in many homes. Must get a chair like that one for the master bedroom.